A Stage Revival, And 50 Years Of Survival, For 'The Boys In The Band' Ever since Mart Crowley's play about a gay male life premiered off-Broadway in 1968, much of the original cast and crew has died of AIDS. A new, star-studded production acknowledges that history. Fifty years after it was first staged, The Boys in the Band is finally playing on Broadway, with an all-gay cast including several film and TV stars. Editor's note: This story includes language that some may find offensive. It was 1968. But playwright Mart Crowley felt he had to write what he knew. "Nobody wanted the play," Crowley says. "Not even agents wanted to look at this play. They just thought it was pornographic and it was outrageous." What he wrote in The Boys in the Band was a thinly veiled slice of autobiographical fiction. A group of gay friends gather for a raucous birthday party; by the end of the evening, secrets are spilled, tears are shed. The playwright says he wanted to capture "the atmosphere of what it was like to be gay and everything you did or felt was against the law, and that you could get arrested for almost anything and it could be blamed on that." Crowley points to one important line that he wrote: "Not all faggots bump themselves off at the end of the story." It's voiced by the character he based on himself. "He was talking about plays in which most of the time, when there was a gay character, they wind up committing suicide or getting beaten to death or sent to prison," Crowley says. "There was always a terrible fate for anybody who was gay. And so, I was determined not to have that happen, here in this." In the 50 years since The Boys in the Band opened, the play has been both lionized as a path-breaking depiction of gay life in the 1960s, and criticized for antiquated attitudes that run counter to the current LGBTQ movement. It's being revived currently on Broadway, with a cast that includes TV and film stars Jim Parsons, Matt Bomer and Zachary Quinto. But it's also important to remember that in those 50 years, many of the original cast and crew died of AIDS. When some courageous producers first took on The Boys in the Band, the play became a phenomenon. It ran over 1,000 performances off-Broadway, and saw productions across the country and around the world. And it was adapted into a film. The original production of The Boys in the Band was adapted into a 1970 movie. 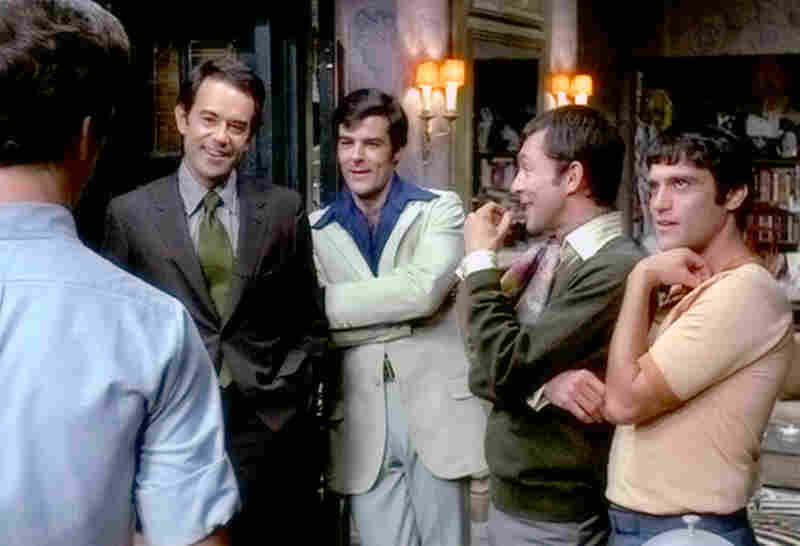 In this film still, Laurence Luckinbill (playing the character Hank) stands in the jacket and tie on the left. Laurence Luckinbill played the character Hank in the original play and the film. Luckinbill, who was a college friend of Crowley's and is straight, says getting actors to appear in The Boys in the Band was difficult. "I went and told my agent — who was gay, whose husband was gay, who were closeted — and I said, 'I'm going to do the play,'" Luckinbill says. "And she said, 'Well, there goes your career.'" Despite the play's success, he did lose jobs, including a contract for cigarette commercials. "The only answer they would give me, it was from the head guy, and he said, 'No fags smoke our fags,'" Luckinbill says. There was even backlash from within the gay community. Luckinbill says an early activist organization denounced the play the day after it opened. "The Mattachine Society criticized us, whining [it] made gay people look bad," he says. I went and told my agent — who was gay, whose husband was gay, who were closeted — and I said, "I'm going to do the play." And she said, "Well, there goes your career." A year after the opening came the Stonewall riots, when members of New York's gay community protested a police raid on a bar in Greenwich Village. That marked the beginning of the modern gay rights movement. And in the following years, the AIDS crisis took the lives of five of the actors, the stage manager, two producers and the director. "And so they basically fell in battle as far as I'm concerned," Luckinbill says. Tuc Watkins plays the same role in the revival that Laurence Luckinbill played in the original. "My initial reaction was: Why are we going to go up into the attic and look at that thing again?" Watkins says. "Because I have come from a place of: I want to be out and proud and move forward and make progress. And it wasn't until we read it and we started talking about it that I was reminded that we need to know where we came from in order to move forward and appreciate the freedoms that we have." 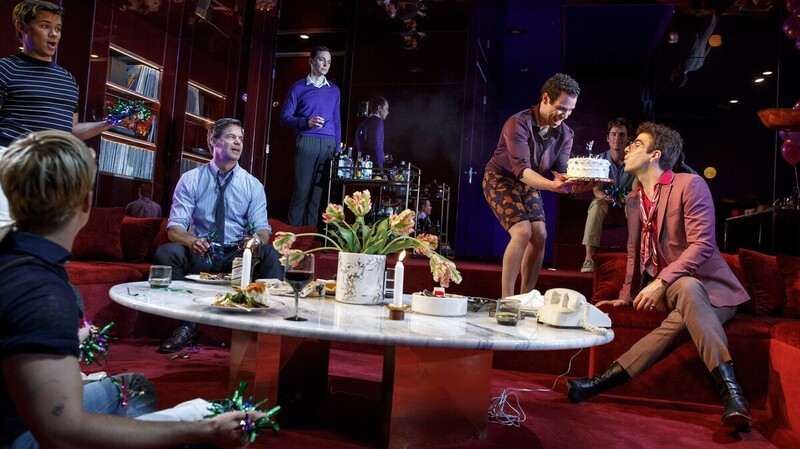 The revival is directed by Joe Mantello, who assembled a cast of nine openly gay actors. Mantello says even he was a little concerned that the play wouldn't speak to gay life in 2018. "This play can't possibly speak for everyone," Mantello says. "But it did speak for Mart [Crowley] and it is Mart's truth. And I think it holds up beautifully." For his part, Mart Crowley is happy that The Boys in the Band finally made it to Broadway. And actor Brian Hutchison says it still connects with audiences on a very personal level. One evening after the play, he met two men in their 80s. "And one of the guys just burst into tears and they were streaming down his face and he couldn't really speak," Hutchison says. "And his friend said, 'You moved him more than you know. He's had a rough road.' ... It's deeply moving to know that there are still people coming to the play who were living that life, you know, and they're still living that life or have those regrets."